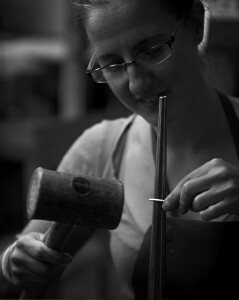 The beginner’s jewellery making 10 lesson term course begins with Health and Safety in the workshop. The students are introduced to the teacher, the tools and metal types. The first project is piercing out metal with a fine saw, then filing and sanding. Annealing, reticulation & fusing metals are demonstrated, by heating the metal. Forming and soldering, refining and polishing skills complete the first project. Students are shown mark making on metal and using hammers and the rolling mill, to demonstrate two more decorative techniques. Ring or bangle making is the second project. Students begin their own projects with demonstrations in each lesson. Bending metal, mitring and straightening wire, forging, doming and the use of a swage block. Design and planning for the making of a piece or jewellery. Identifying the materials to be used. Stone setting with bezel strip and bearer wire. Strip soldering and flood soldering. Day Time Courses: Monday, Tuesday & Thursday 9.30am – 12 noon, Wednesday lunchtime 12 noon – 2.30pm. Evening Courses: Monday, Tuesday, Wednesday & Thursday: 7.00pm – 9.30pm. All courses take place at Rachel Jeffrey’s Workshop at 2a Mill Walk, Wheathampstead, next door to the main Rachel Jeffrey Jewellery shop. (All tools are provided, however material costs are additional). Please note places can only be secured once payment has been received. Payment can be made by card by visiting the shop or over the phone or by BACS. Alternatively by cheque paid out to ‘Rachel Jeffrey Jewellery School Ltd’. Please note the cost of the course is non-refundable. A partial refund may be made, only if your place can be filled, minus a £10.00 admin fee. Lessons missed cannot be rescheduled, unless we have had cause to re-arrange a lesson. For more information, please refer to our Terms and Conditions.